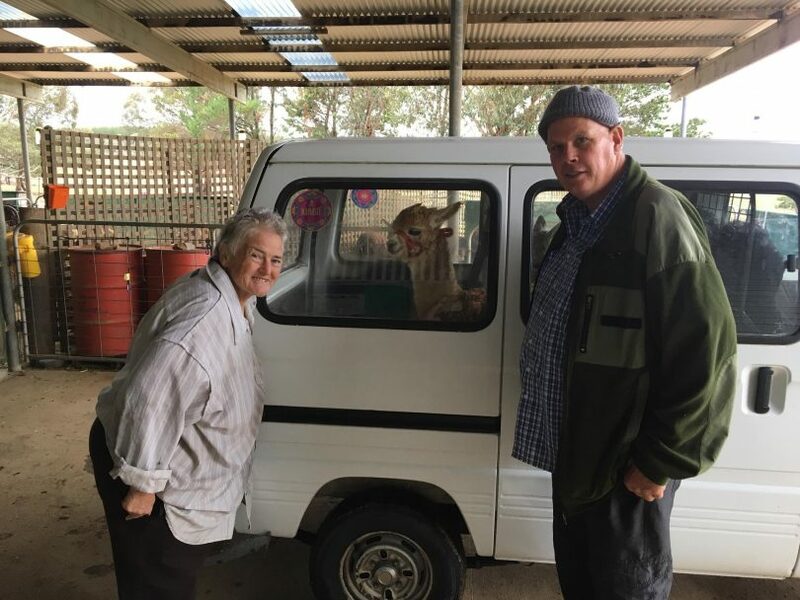 Glynda Bluhm from Alpaca Magic and Nils Lantzke of Alpaca Therapy load Paprika and her mum into the Alpaca Therapy van. Photo: Facebook. It’s been an emotional rollercoaster for Alpaca Therapy’s Nils Lantzke. Last week, his beloved alpaca Mimosa was put down after being brutally mauled by an unleashed dog. This week, he’s taken delivery of a three-month-old baby alpaca called Paprika, thanks to the generosity of several local business owners and Hit 104.7’s weekend team – Ellie Mobbs, Bethany Larsen and Jason Roses. When Region Media spoke to him, Nils had just unloaded Paprika and her mum, Papaya, from his truck after taking delivery of them. He’d paid a visit to his old friend Glynda Bluhm at Alpaca Magic at Sutton last week as both Mimosa and his surviving alpaca, Hercules, were bred there. “I thought I’d just have a look at some babies and see if there was anything with potential. They all ran away except this one little one [Paprika] which came over and rubbed noses with me. She had such a sweet little face and I thought she’d be wonderful for the Mental Health Unit. When Nils arrived at the radio station, he learned that the Hit 104.7 team had organised local businesses Terracon Legal, Papas Painting, Lit Consulting, Papas Projects & Alpaca Magic to purchase Paprika for him. Hall Stockfeed has also donated hay. There wasn’t a dry eye in the place – Nils says that everyone was emotional including Jason. And they weren’t the only tears. Nils says that when he was bringing Paprika and Papaya home, he was overcome with emotion and had to pull off the road. “I put the hazard lights on and bawled my eyes out,” he says. He wants to thank each of the businesses personally and hopes that when Paprika starts working, they’ll take pride in having had a hand in making it possible. Paprika’s mum, Papaya, will be with her for the next three months until she’s weaned. Hercules similarly arrived at seven weeks, and Honeycomb, the first alpaca so familiar to Canberrans from his trips around Canberra in the back of Nils’ red Mazda 121, came at just two-and-a-half weeks old. Paprika is mid-tan and Nils says she has “a really cute little face”. Paprika will now learn to wear a halter and walk on a lead, initially in the backyard until Nils is confident she’s safe. She and Hercules will also get to know each other, although she’s already rubbed noses with him. Nils says he has been “pretty overwhelmed” by the strength of the reaction from the Canberra community and further afield to Mimosa’s death. He’s had personal messages from as far away as Texas, condolences from the Australian Alpaca Association and the RSPCA among others, offers of alpacas from breeders at Leeton, Captains Flat and Goulburn and offers of donations. “When I go out to the Mental Health Unit or the hospice I’m focusing on those people at that time and I tend not to think of the wide-ranging effect of the work,” Nils says. “I’m just glad I can do it for people, that I have the means to make them feel happy for a minute. Nice update to a sad story. Have they caught the evil monster who allowed his dog to commit the crime, and who filmed it? Omg. How adorable is she !!! The best and most beautiful news! Well deserved, a very close family member of mine got the pleasure of your amazing animals in the last weeks of her life. Thank u so much.